I met Michael through my active involvement with the Oxford University Tape Recording Society (OUTRS). Its members were undergraduates with an interest in recording all kinds of events within the University – music performed by students, lectures by visiting dignitaries, sound effects for plays, and so on. 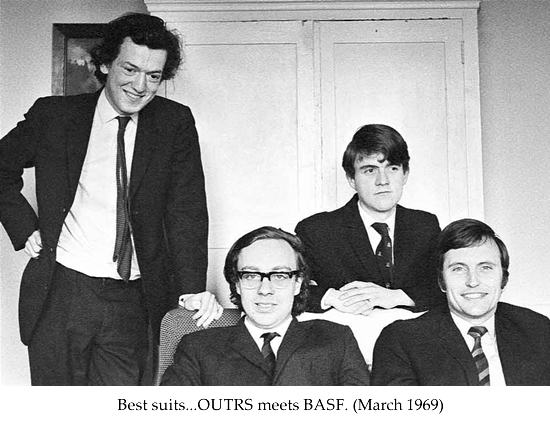 By the summer of 1967 I had already been helping to run OUTRS for a year or two, taking care of the finance and organisational side while a friend dealt with the technical side. Then there was a crisis when he failed his summer term exams and was forced to leave the University. I was about to enter my final year as an undergraduate and desperately needed other people to get involved in running the Society. I had to do some revision for my exams and plan for the possibility of leaving the University at the end of the summer term - though as it turned out I stayed on to do research and spent even more time on OUTRS activities! In the event, the autumn term proved a turning point, since Peter Craven and Michael Gerzon became involved within a few weeks of each other. Peter wrote to me asking if OUTRS could help with making a recording. I went to see him in Wadham College and had ‘a very interesting and stimulating conversation – haven’t had one like it since [my friend] was ejected’. It is ironic that Peter was initially seeking help from OUTRS, since in a very short time it was his expertise, time and equipment that was keeping the Society going! Peter, like Michael, was studying mathematics and was one of the few people who could understand Michael’s more original discoveries. Crucially, Peter is an innovative electronics designer and could translate Michael’s theoretical demands into practical devices. Peter also stayed on to do research after taking his degree, maintained his leading role with OUTRS and continued to collaborate with Michael after leaving Oxford, notably on the sound field microphone and lossless coding for audio discs. They were working closely together on the latter at the time of Michael’s death following an asthma attack in 1996. 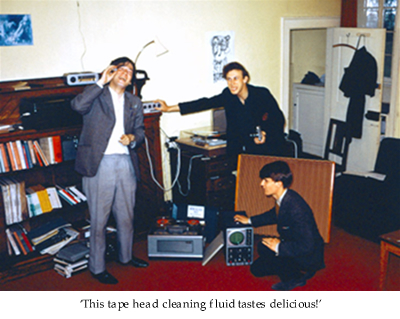 Michael was a friend of Peter and I met him for the first time in December 1967 when he and Peter set up their respective tape machines (Revox F36 and B&O Beocord 2000) with Peter’s Reslo ribbon microphones to record the rehearsal of a concert taking place in Wadham College Chapel. Part of the rehearsal of Mozart’s C minor Mass (K427) is preserved in the British Library Sound Archive on C236/107. Intriguingly, Michael’s interest in surround sound is already evident, because the recording was made using what he described as the ‘Ambiophonic’ technique (not to be confused with Ambisonics, which came much later) [Ambisonics section]. This was an attempt using only two channels to capture the acoustic of a performance space on a recording, and place the listeners inside that space during playback. 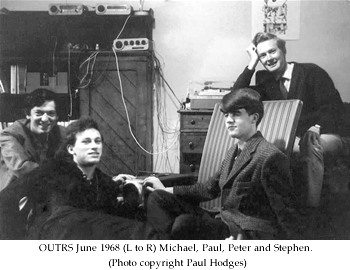 At around this time I met Paul Hodges, who joined OUTRS through his friendship with Michael, and was very active until he left to join the BBC after his Final exams in the summer of 1968. 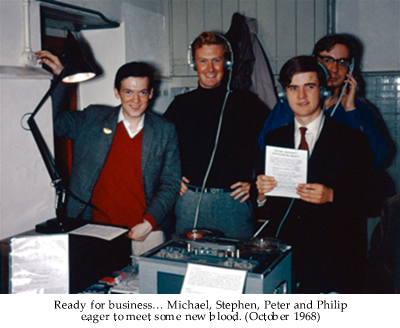 Paul, Peter and Michael made recordings of a concert by the Schola Cantorum of Oxford in the Sheldonian Theatre in February 1968. This went down in OUTRS history as they were among the best performances which we ever recorded. The main pieces were Handel’s Dixit Dominus conducted by John Byrt (C236/75) and Fauré’s Requiem conducted by Howard Williams (C236/650). The session was nearly a disaster when the home-made microphone amplifier failed and was repaired with only seconds to spare! These tapes were often used as benchmarks in playback sessions to compare with subsequent recordings. 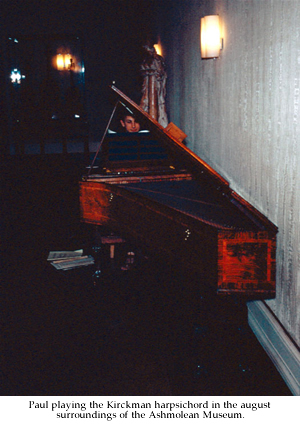 Michael drew important conclusions from two fascinating recording sessions in which Paul obtained permission to play the 1772 Kirckman harpsichord in the Ashmolean Museum. The first session was marred by trouble with the microphone amplifier (again! ), so there was little time to record. Paul ‘laboriously tuned the harpsichord’, then played some pieces ‘with life, and regard to the rhythms’. The recording (made at 19 cm/s) was disappointing, and Michael said it made the harpsichord sound like an out-of-tune piano. He realised that the strong high frequency transients of the instrument failed to register adequately on the recording level meters (even the more sensitive magic eyes on his Revox F36), leading to the tape being recorded at too high a level. This resulted in distortion and loss of high frequencies. Michael played the recording to several OUTRS members one evening in his room at 52 Walton Crescent. Unfortunately, it was set to play in mono at first and ‘we sat wondering why it sounded so horrid’. When played in stereo, the result was ‘not bad, though the bathroom acoustic’ in the Ashmolean was shown up in comparison with the ‘very dry recording on an excellent EMI Baroque series’ LP, also using a Kirckman instrument. I thought the evening was ‘a very illuminating and enjoyable session’. While the millennium has not yet arrived in realistic sound recording and reproduction, at least OUTRS members have now heard what Haydn and Beethoven sound like on the sort of instrument that much of their music was originally played on; one must then wonder why people play them on the modern grand piano. Michael decided that as well as using a low recording level, the next step in the search for the millennium was to increase the tape speed from 19 cm/s to 38 cm/s. This was at a time when it was rumoured that some commercial studios were saving money by switching from 38 to 19 cm/s, and that the higher speed was only used when essential to make editing easier. He bought a second-hand 38 cm/s Revox F36 early the following year and the improvements in quality were immediately obvious. We could use a lower recording level to reduce distortion without tape hiss becoming too prominent, and drop-outs and modulation noise were also less noticeable. However, the most welcome and unexpected benefit of the higher tape speed was the much greater stability of the stereo image, giving a more spacious and realistic sound stage. Michael’s explanation was that the reduction in short, low-level drop-outs allowed the ears to ‘lock on’ to the image and be more convinced by the illusion of space. Within a few months, Peter went one better by purchasing a TRD deck running at up to 76 cm/s, for which he designed and built his own electronics. In autumn 1968, Philip Allen took over from me as Treasurer of OUTRS, while I changed from being an undergraduate with long vacations to a full-time research student. Philip was a singer and so knew many fellow-musicians, which meant he was in a good position to obtain more recording commissions. Coupled with a sound business brain and practical common sense, he soon improved the finances of the Society. This should have left me free to pursue my research project, but somehow I always seemed drawn to the latest development dreamed up by Michael. Philip had a room in Pusey House on St Giles and we used the Common Room for meetings, so his room soon became the nerve centre of the Society. It was also close to the Maths Institute, which made it convenient to keep an eye on Michael. Peter and I would often have supper with Michael in the evening and then descend on Philip to drink his coffee, discuss Michael’s schemes, and plan OUTRS business. Making copies of our recordings for sale to performers was an essential part of the OUTRS service – unless someone was prepared to take the time to make good quality copies, there would be no income to fund future developments, and no repeat business. It was this regular flow of recording dates which allowed Michael and Peter the opportunity to test their ideas. Philip willingly undertook the lion’s share of the copying chore during his time in Oxford. The University clubs and societies held a large Fair at the beginning of each autumn term to attract new members (Freshers). OUTRS depended on a small number of enthusiasts so it was important for us to identify these early in their undergraduate careers before they become committed elsewhere! We therefore put a lot of effort into producing a flyer and preparing tapes which we could play over headphones to potential new members at the stand. This was bait to attract people to an open meeting where we could play tapes and talk to them in more suitable surroundings. On the day of the Fair itself, the photos show Philip wheeling the invalid carriage laden with equipment, and all of us ready to pounce on unsuspecting prospects! We had purchased BASF tape for our own use and for sale to members for some time, and their representative, Mr Rickerby, became intrigued by the goings-on in Oxford. We were delighted to take up his offer to come and see us. He entertained us to a very nice lunch, after which we went to Peter’s room to play him some of our tapes. He had a wide musical taste, though was less familiar with some of the technicalities expounded by Michael. He was very accommodating, offering the Society a good discount and extended credit on our tape purchases, and arranged for last-minute orders to be sent from London by train. 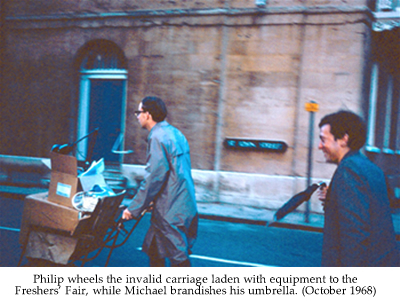 Philip often collected the tapes by wheeling the OUTRS invalid carriage (otherwise known as the trolley) to the station. At this point, we had the enthusiasts, enough basic equipment and regular recording dates to allow Michael’s ideas to be tried out in experimental sessions. This meant we were poised to take the quality of recording and playback to a more advanced level.